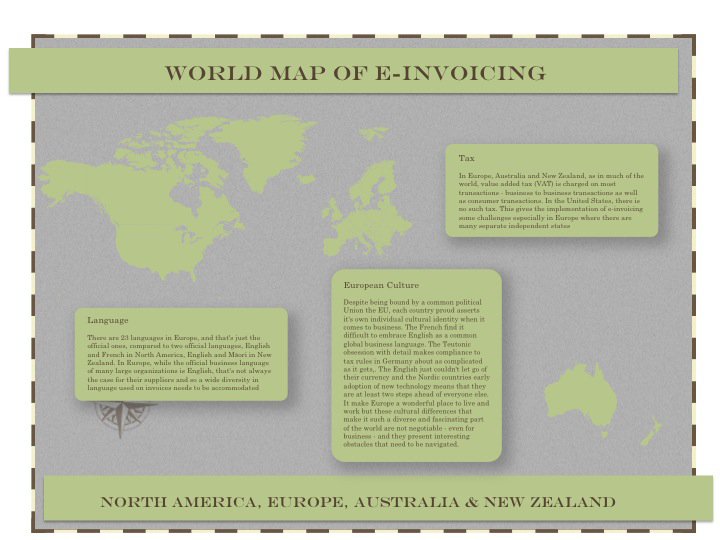 This is the second in a series examining the global landscape for e-invoicing. The first, an overview can be found here. Of all the economic regions in the world, electronic invoicing is most well established within Europe and North America. This is hardly surprising. As economies, they are amongst the biggest and most technologically mature. They have much in common culturally, politically and in terms of they way they do business but despite the many similarities there are some very distinct differences that makes the implementation of e-invoicing in each region very different. There is a fundamental difference between Europe and the US when it comes to invoicing. In Europe, as in much of the world, value added tax (VAT) is charged on most transactions – business to business transactions as well as consumer transactions. In the United States, there is no such tax. This gives the implementation of e-invoicing some challenges for European organizations. The importance of tax cannot be overstated. Put simply, an invoice is the documentary evidence of the details of a financial transaction upon which tax authorities rely in order to ensure they are collecting the right amount of VAT from a business. Because businesses are able to reclaim VAT paid, it is important that they are able to provide an indisputable audit trail of their transactions. Traditionally, this has meant keeping paper copies of all invoices and in the modern world, a digital copy. But it is the exact nature of the digital invoice that makes e-invoicing complex in Europe. Despite there being a single set of guidelines that each EU nation follows (as well as some non EU European nations), each has a slightly different interpretation. Some countries require digital signatures to verify the authenticity of an electronic invoice. Others have special requirements concerning the archiving of digital invoice in particular where, geographically, it is archived. Falling foul of the rules can be an expensive error and the authorities can, and do, impose substantial fines for discrepancies. As technology develops, some of the traditional concepts that the tax authorities set much store upon are becoming archaic. The increased adoption of cloud technologies for example makes the geographic location of stored digital media difficult to pin down. Technology evolves faster than the legislation and, although governments are catching up, because of the varying interpretations of how the technology should be deployed, the European landscape remains much more complex than the United States. There are 23 languages in Europe and that’s just the official ones compared to two official languages, English and French, in North America. In Europe, while the official business language of many large organizations is English, that’s not always the case for their suppliers and so a wide diversity in language used on invoices needs to be accommodated. But language is simply the most obvious manifestation of the cultural diversity in Europe. Despite being bound by a common political union, the EU countries (and for those European countries outside of the EU, like Switzerland, that conform largely to the political and business conventions of the EU), each country proudly assert their own individual cultural identity when it comes to business. The French find it difficult to embrace English as a common global business language. The Teutonic obsession with detail makes compliance to tax rules in Germany about as complicated as it gets. The English just couldn’t let go of their currency and the Nordic countries’ early adoption of new technology means that they are at least two steps ahead of everyone else. It makes Europe an interesting place but these cultural differences that make it such a diverse and fascinating part of the world are not negotiable – even for business – and they present interesting obstacles that need to be navigated. There is no shortage of evidence that e-invoicing can pay off. In North America there’s a single set of rules that makes the project costs easy to quantify and employment legislation is relatively flexible compared to Europe allowing businesses to deliver human resource efficiencies more easily. On the one hand, the relative complexity of business in Europe makes the automation of business processes such as accounts payable even more compelling, the complexity of compliance, particularly for an organization that trades beyond it own country boundaries, can present a challenge that is difficult to overcome. Internal approval from tax people may not be forthcoming and the approval process can be lengthy. Europe is to damn different from one country to another, this is why I don’t believe in a federal Europe, there are to many differences, especially business related but also political and cultural….